Although I’m not usually someone who goes into big competitions expecting to win, for the Inner Circle I have my sights on the prize. Inner Circle is similar to Armies on Parade, the objective is to have an army and a display board done to the highest caliber, but my entry will be judged by a set of painting and building criteria alongside getting votes from the community. My army will be a Renegade Guard list featuring models from the Forgeworld Death Korps of Krieg range. All imperial markings will be removed and my artillery models will all have a different look to avoid a cookie cutter appearance. In total I’ll have 65 infantry models, 4 Thudd Guns with crew , 2 Heavy Mortars with crew and a Medusa Siege Cannon Artillery Carriage with crew on a custom base. The plan is to get a unit done every week, which will leave plenty of time to build my display board from the ground up before my May 13 deadline. I will be posting weekly progress and get into more details when my order comes in. It’s time to go big or go home! 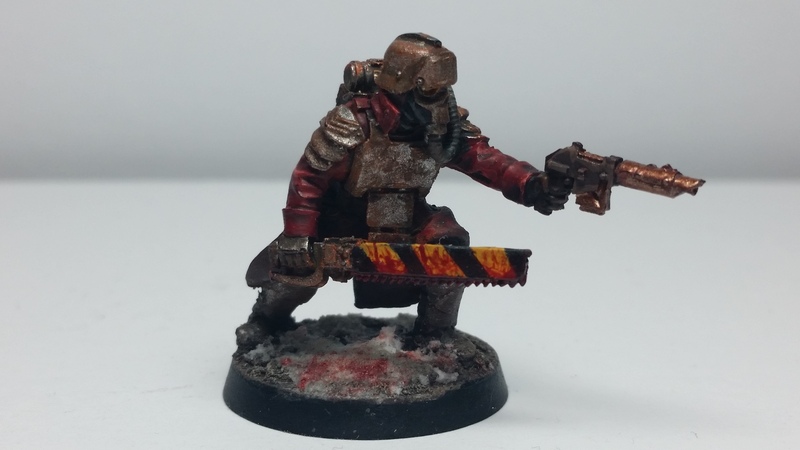 The first infantry unit of Renegade Veterans was made using Death Korps of Krieg Grenadiers models, with the aquillas removed and the power cords left off. Aside from the cords being impossible to deal with while building, it gives the Veterans a ramshackle look that fits the theme. The criteria for the competition is a story for your army, my story describes the slow descent into disease and madness of a regiment of Death Korps stationed on irradiated mountains that were once home to a powerful cult of Nurgle. I’ll go further into my painting process and plan to do a step by step guide as well.